I have to tell you I love this book! The “12 Week Year” was written by Brian Moran and Michael Lennington. The basic idea of this book is that you can get more done in 12 weeks than others do in 12 months when you implement the concepts outlined in the 12 Week Year. I have to say that I agree with this. The magic word here is “implementation”. If you create your 12 week plan and then implement it you will succeed. I bought the book a little over 6 months ago and I am still learning how to build a solid 12 week plan that stretches me (in a good way), but one that’s not so aggressive that is an impossible challenge. I have a tendency to put so much into my plan that it is a real stretch for me to actually be able to implement everything. I do love the results that the 12 week plan creates. When you follow the plan it definitely fast tracks your results. Someone said to me, “What if I fall short? What if I don’t nail everything on my list”? The answer is that you will still be light years ahead of everyone else that doesn’t have a plan. The one thing that differentiates great performers from those that are mediocre is their ability to execute what they know and what they know they need to do. Most of us know what we should do, but actually putting together a plan and executing it is a whole different matter. That’s where the best laid plans tend to fall apart. When it comes to achieving our goals, there is often a gap between what we should be doing and what we are actually willing to do to get there. We often find a way to avoid doing the hard stuff. Big annual goals are great and they are necessary for growing your business. But how do you nail the implementation piece when life continually gets in the way? The answer is to create 12 week blocks of time and decide what you will put your focus on for just that 12 week period. You have to keep your eye on the big picture while creating an executable plan of action. Keeping your promises to others builds strong relationships, and keeping promises to yourself builds character, esteem and success. Those are some pretty bold claims but I believe that they are true. Living the 12 week year will force you to create priorities, plan how you intend to accomplish your 12 week goals which in turn will allow you to accomplish your goals in record time. That sounds pretty impressive doesn’t it? Long term results are created by consistent actions you take every day. While it’s important to plan for the future, that future is actually created by the actions we take every day. We may not always be able to control our results, but the one thing we have control over is those daily and weekly actions that ultimately create our results. Once you have your plan for the next 12 weeks, you then create a weekly plan which is implemented by your daily actions. It sounds simple doesn’t it? It’s simple but it’s not always easy like a lot of other things in your real estate investing business. So let’s look at each one of these three principles. 1. The first one is accountability. Accountability happens when you take ownership the implementation of your plan regardless of what life throws your way. Accountability is part of a person’s character; it is when a person is willing to own the actions and the results. 2. Next is commitment. Commitment is a promise you make to yourself. The book says, “Keeping your promises to others builds strong relationships, and keeping promises to yourself builds character, esteem and success”. 3. The third principle is greatness. The book points out that greatness in the moment is all about making the choice now to do what is necessary to become great. Your ultimate results are only the confirmation of your greatness. Greatness is actually achieved long before you see the results. 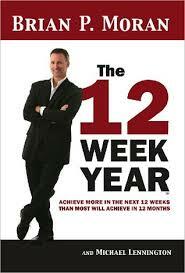 Create a realistic plan for your 12 week year so that you will achieve your goals in record time. It also addresses some of the common pitfalls everyone is likely to face, and it has a whole list of success tips to help you along the way. Finally, there is a whole chapter devoted to your first 12 weeks so you start off on the right foot. Whether you decide to follow the plan word for word or implement your own version of the 12 Week Year, I can promise you that you will see dramatic results if adopt the principles of this book. Even if you don’t have your copy of “The 12 Week Year” today, you can take the 1st step and write down the things you want to accomplish in the next 12 weeks. Make it an ambitious list. Then you can get your book and get all the details right for your own 12 week plan. Get an accountability partner to help you stay on track. ← Why Aren’t There More Successful Women In Real Estate Investing?